In a case study of dams on the upper Missouri River, USGS researchers have demonstrated that an upstream dam is still a major control of river dynamics where the backwater effects of a downstream reservoir begin. In light of this finding, the conventional understanding of how a dam can influence a river may have to be adjusted to account for the fact that effects of river dams can interact with one another. One of the greatest modifications of rivers by humans has been the construction of dams that provide valuable services such as irrigation, hydroelectric power, navigation, flood protection, and recreational opportunities. Hundreds of thousands of dams have been built worldwide, beginning for the most part in the 20th century. 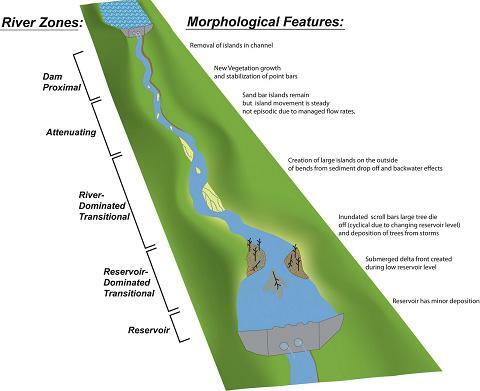 The diagram correlates the river zones created by large dams (shown on left) to the morphological features (described on right) that each zone influences. The downstream effects of river dams have been well documented by previous researchers. In the presence of a dam, it can often take hundreds of kilometers for a river to adjust to its natural state. The upstream impacts of dams have also been widely considered, particularly sedimentation of reservoirs. These effects may extend upstream for many kilometers. Working with historical aerial photography, streamgage data, and cross sectional surveys in a careful analysis of the Garrison (N.D.) and Oahe (S.D.) dams on the Missouri River, the USGS researchers propose a conceptual model of how interacting dams might affect a river’s physical characteristics (geomorphology). This model applies to dams on large rivers and divides the river into various zones of predictable behavior (Figure 1). The researchers also conducted a geographic analysis of dams along 66 major rivers (as listed in a standard professional reference) in the contiguous United States to determine how often dams occur in a series. Of the rivers analyzed, 404 dams were located on the main stem of 56 of the rivers. Fifty of these rivers had more than one dam on the river creating a total of 373 possible interacting dam sequences. The results from this work indicate that more than 80% of large rivers may have interactions between their dams. Given this widespread occurrence, the USGS investigators suggest that dam interaction is prevalent and should be the focus of additional research. The study was published in the journal Anthropocene (Oct. 2013).